Get ready, North Texas! 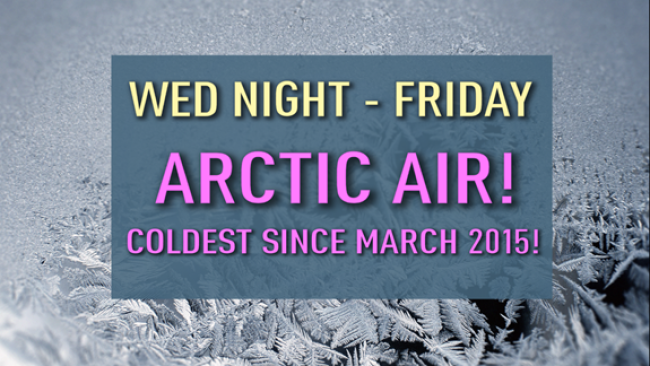 I'm tracking the coldest air so far this season. It'll pay us a visit late Wednesday night into Thursday and Friday! Very cold, Arctic air is loading up way to the north in Canada and Alaska. Below is a look at the temperature map this morning. 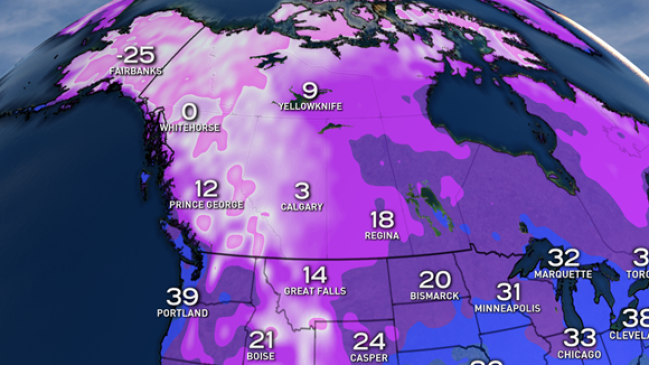 Note the single digits in Canada and the sub-zero temperatures in Alaska — 25 below zero in Fairbanks! This is a significant batch of cold air, even by December standards. This Arctic air wouldn't stand a chance making it this far south into Texas if the jet stream wasn't expected to undergo a big change. That's exactly what's going to happen later this week. Below is a map of the upper level wind pattern (jet stream) by late in the week. The upper level winds will push the Arctic air deep to the south and east. Parts of the country will only see highs in the teens and 20s. 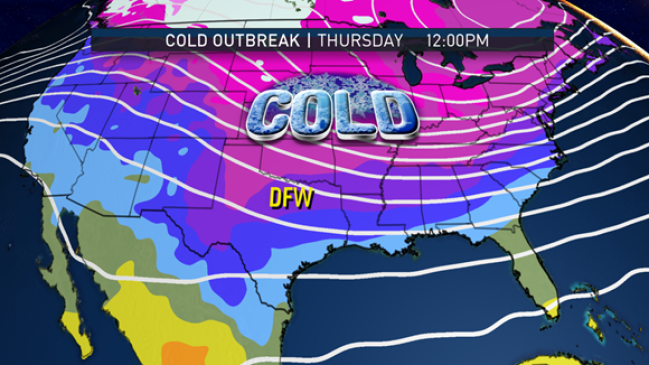 Here in North Texas, the front will start moving in Wednesday night. By Thursday I'm expecting the morning wind chill to be down into the teens! At this point it looks like the front will come through dry, so there's not much hope for snow. 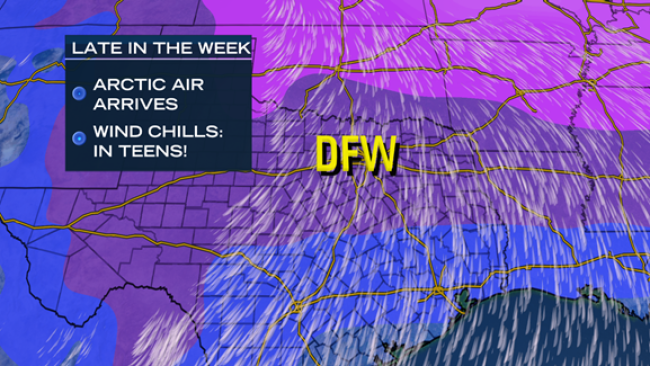 With lows in the mid 20s, it will be the coldest temperature at DFW in 21 months! Looking ahead, temperatures should moderate a bit into the weekend (50s and low 60s). Further down the road, another batch of potent Arctic air may be lurking in the 10-12 day timeframe. 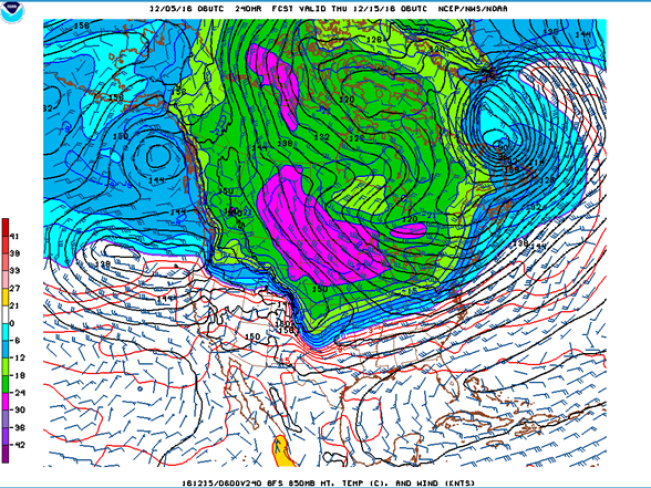 The GFS model is showing this air (note the purple) of -24 degrees at about 5,000 thousand feet off the ground. This would be even colder than this first batch. The timeframe for the image below is Thursday, Dec. 15, in which the Arctic air is still to our north but likely to push farther south. In summary, it looks like it's going to be a cold start to winter despite a very warm end to November (warmest on record for DFW). In addition, many of the winter forecasts may prove to be wrong, which were suggesting a warm start based on the remnants of La Nina. At this point, I'm putting my money on the cold!